Six days have passed since the tragedy of Sandy Hook Elementary School in Newtown, Connecticut. Five days of what started as shock and quickly turned to resigned horror and grief. As we gaze into the eyes of precious children—their beautiful faces smiling at us from family photographs—who will never again attend school, play with friends, or hug their mom and dad, most of us find it nearly impossible to keep from crying. The bravery of the teachers and school administrators who died trying to protect the children and the terrible thought of what they and those poor kids endured in their last moments is enough to reduce anyone with a heart to tears. So we cry, and we vow to love our kids more, to strengthen our efforts to protect them from the danger that visited Newtown. In the midst of this national, even international, grief, the politicians rise up, ever ready to demonstrate a callous, preening self regard, and make emotional calls for ill-thought-out laws. Yes, in a moment of intense national pain, they choose not to address the evil that is at the heart of this tragic massacre, but rather, propose quick, intemperate “solutions” that neither address the fundamental problem nor preserve the liberties enjoyed by all citizens of the United States of America. Whether liberal or conservative, Republican or Democrat, most of our political class leap to the podium to denounce the murders of these precious souls, offer their quick fix, and preen for the cameras. No murderous young man killed my daughter; however, I am certain that my feelings of grief, anger, and sorrow mirror those of the parents and siblings of these precious ones. What I learned through my time in the valley of the shadow of death was this: no words of encouragement were beneficial and no commitment to address the situation leading to my daughter’s death was comforting to my wounded soul. In fact, the only thing that broke through all of the anguish I felt was the loving hugs of those who simply said “I’m so sorry” and held on as if they would never let go. I recall one of my aunts attempting to encourage my wife and me by telling us how our baby was in heaven with God and we would see her one day. As a Christian, I believe this to be true. However, at the time, my wife and I had to restrain one another so that we didn’t beat the ever-living crap out of my aunt. She meant well, but she didn’t have a clue as to how painful and condescending her words were, nor how enraged they made us. Heaven? A reunion in the great by and by? I wanted my daughter here with me right now and I didn’t care to hear platitudes offered as compensation for her absence from my arms. So, what should we as a nation do in response to this terrible event in Newtown? We should shut up. Just shut up. Offer our sympathy to those who have suffered this terrible loss and give them the time to grieve. A really good start would be to punch any politician or journalist/pundit in the nose if they begin their pontificating about what we should do to a) protect children at school, b) restrict guns amongst the general population or, c) improve mental health services throughout the nation. The time will come soon enough to think through the issues at hand; however, nothing as yet stated in the press has acknowledged the awful fact that a great evil was at work in the murderer, Adam Lanza. It was not simply a lack of mental health services, the relative easy access to guns, or a lack of security at our schools that drove him to this heinous act. As uncomfortable as many modern, supposedly-sophisticated Americans are with this truth, there is evil in this world and young Adam was driven by it. This thought is discomfiting, since it implies a force at work that isn’t governed by our politics, cultural consensus or legal system. No, evil is at work in the hearts and minds of men and women quite apart from, and in spite of, the civilizing constructs of humanity. It is an implacable foe of mankind. Men have known this for millennia, but, in this arrogant, technologically-confident age, many have sought to deny its very existence. The events at Sandy Hook Elementary School remind us again that our attempts at denial will not stand up to the terrible reality of evil. As I was writing this article, President Obama held a news conference that I watched. In that news conference, he announced that Vice President Biden would be heading up a task force that will seek to find ways to address the tragedy at Sandy Hook Elementary and try to prevent such a thing from happening again. I seldom appreciate our current president, but I have to give him credit for not simply announcing another hare-brained scheme that could be quickly implemented and give him a reason to declare the issue resolved. Instead, he took the measured approach of asking Vice President Biden to have some recommendations in a month. Whether Vice President Biden, or anyone, can develop effective recommendations in a month or even a year is a real question. However, I applaud the president for not proposing a quick fix, but, instead, seeking to take a responsible, thoughtful approach to the problem at hand. That said, I don’t think there is very much that government can do to overcome such evil—at least, not without violating either the personal liberty of citizens in a free society or the right to bear arms enshrined in the 2nd Amendment. No, in my opinion, and in the opinion of the Bible, it is a God thing, and we must, as a nation and as individuals, renounce evil and seek the salvation and deliverance of a Holy God. Only He has the prescription that will stop this kind of murderous, hateful, demonic assault. 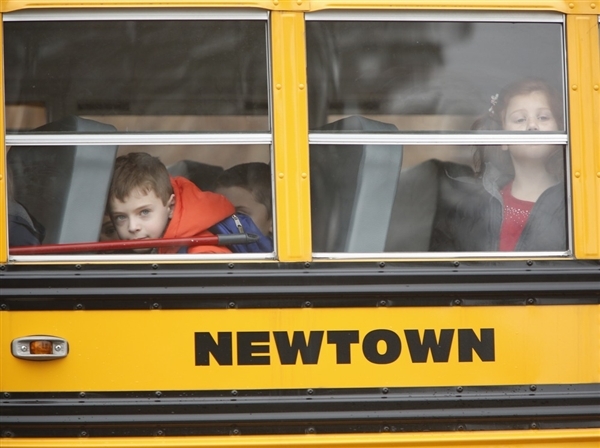 My prayers go up for the good people of Newtown, Connecticut. As those prayers rise up before God, joining with millions of others, I hope that they bless Him and procure blessings upon the survivors of those who were killed. May the evil that was in Adam Lanza’s heart be eradicated from this Earth by God’s loving plan for our lives and may no other town be so afflicted ever again. Perhaps it is too much to ask, but I also pray that our politicians exercise some humility and our journalists and pundits exercise some grace in dealing with this latest sorrow.